Inside Out: Rethinking Traditional Safety Management Paradigms illustrates the concepts and techniques needed to achieve world-class safety performance both at work and away from work. Readers are given step-by-step instructions on how to apply these concepts and techniques to enhance near-miss reporting, accident/incident investigation, job safety analysis, compliance training and behaviour-based safety processes. Larry Wilson is the creator of SafeStart and a sought-after speaker at health and safety conferences around the globe. His several decades of experience in professional safety and analysing human error culminated in the writing of this ground-breaking work on workplace safety. Drawing on real-life experiences with safety challenges in companies around the globe, he lays out universal safety concepts and Critical Error Reduction Techniques in this comprehensive book. Find out more about Larry Wilson in his profile here. 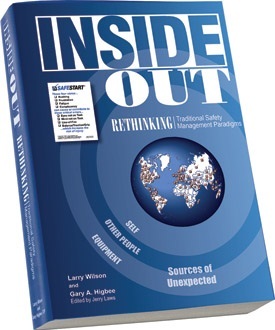 Inside Out: Rethinking Traditional Safety Management Paradigms, authored by Larry Wilson and Gary A. Higbee. Gary A. Higbee, eMBA, CSP has been working in professional safety for more than four decades. He is an experienced and widely recognised safety consultant and speaker who has earned several prominent awards. For SafeStart, he has been involved from the outset and has contributed to the programme in many respects.